Sometimes, there are those cakes that just make you go oh, which is why I have a Pinterest board just for cakes like that HERE. Well, this Orange Cornbread Cake needs to get added to every single amazing Pinterest board you have! It’s just that good! It’s the perfect dessert for any occasion and it’s not as much work as it looks to be. I promise! I love cakes that are stunning. I especially love cakes that take flavors of the season and turn the into something that is picturesque. That’s exactly what this cake does. 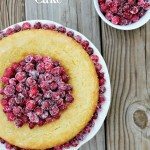 The orange cornbread cake is covered with an orange glaze and then topped with sugared cranberries. I usually make a cheesecake for Christmas, but this year I’m going to be making this stunning masterpiece. 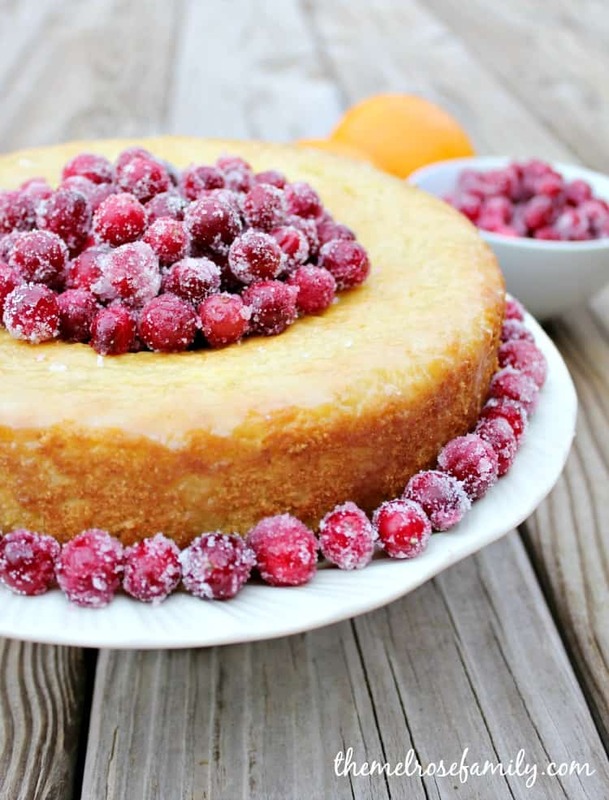 The sugared cranberries scream Christmas to me and the cake is light with the hint of orange. Perfection! The key to getting this cake from ordinary to extraordinary was definitely the sugared cranberries. They were so easy to make and were the perfect way to hide the pooling of the orange glaze on the sides of the cake plate. 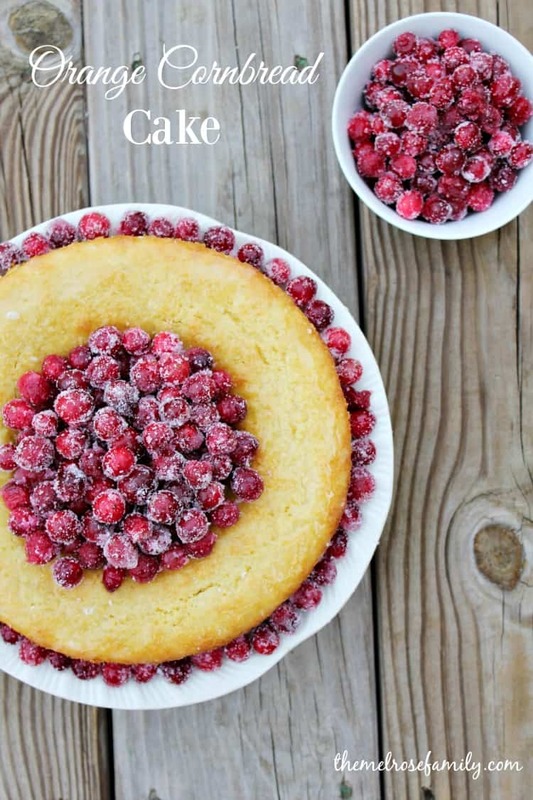 A 12″ cake plate is the perfect size cake plate to use. I love porcelain pedestal cake plates. I think they are just so elegant and the perfect gift idea. 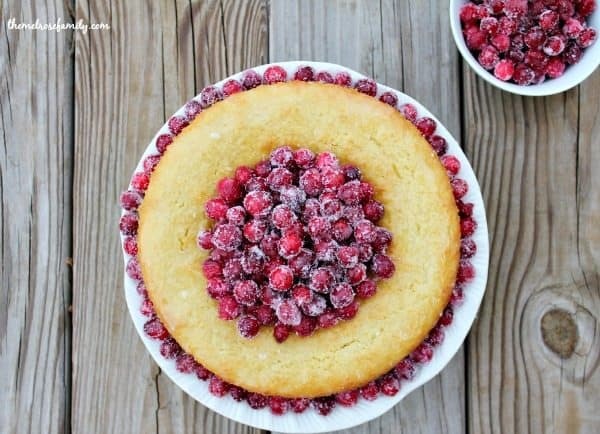 An Orange Cornbread Cake with Sugared Cranberries is a light yet sweet cake perfect for every occasion. Preheat the oven to 350 F. In a sauce pan bring 1/2 a cup of water to boil and add in 1/2 cup of sugar until it is dissolved. Add in the bag of cranberries and mix to coat. Do not allow the cranberries to start popping or you'll end up with cranberry sauce. Drain the cranberries and set them on a baking sheet to cool for thirty minutes. In a large bowl combine the dry ingredients. In a smaller mixing bowl combine the wet ingredients and mix. Fold the wet mixture into the dry mixture until it is combined. Grease an 8 inch cake pan with coconut oil and place a round piece of parchment paper on the bottom of the greased pan. Pour the batter onto the parchment paper and place in the preheated oven. Bake the cake until a toothpick comes out clean for about 30 - 35 minutes. While the cake is baking, roll the cooled cranberries in the other 1/2 cup of sugar until they are coated and let sit. Meanwhile, prepare the orange glaze by combining the juice of one orange and 1/4 cup of confectioners sugar. You want the glaze to have some consistency to it so continue to add sugar if it's still too runny. Once the cake is done baking, let cool and then use a knife along the edge of the cake and flip it onto a cake pan. Pour the glaze all over the cake and allow it to stream down the sides with glaze pooling along the edge of the cake. 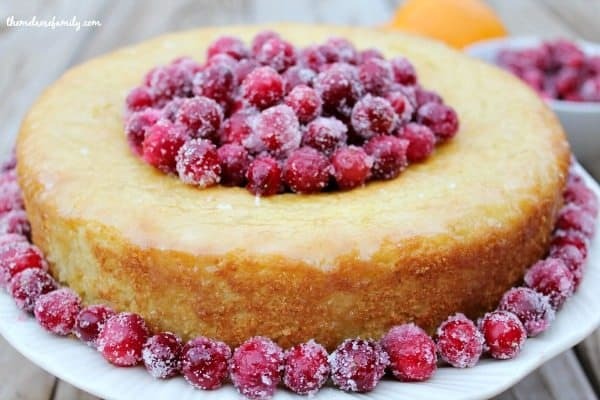 Place a heaping handful of sugared cranberries in the center of the cake and along the edge where the glaze has pooled along the edge of the cake. Be sure to store you cake in a carrier like this one. It makes it easy to transport your cake and the cake stand will fit underneath so you don’t need to worry about setting up your cake once you get there. Beautiful! I love the combo of orange and cranberry — in fact, I made Orange Cranberry Corn Muffins for Thanksgiving dinner yesterday. So delicious. I bet this cake is amazing!